Tracy" came to us in 2003 from a dispersal sale out of Missouri. She arrived on a beat up trailer, with a colt by her side, and three other mares she had grown up with. At the time we acquired her, Tracy was an unassuming $1,500 horse "out of a field". 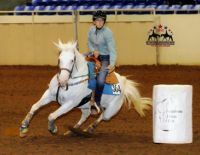 It wasn't until she was six years old she was even started under saddle. However, this mare proved to be the epitome of what a true Appaloosa is. She never argued with any new thing presented to her to learn. She was tough, stoic, and kept on going and going through thick and thin. 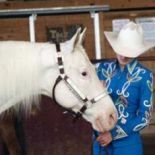 In time, she won over 7 saddles, scads of buckles, and countless ribbons. She has ROMS in many events giving her the acquired title of Versatility Champion. 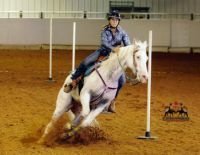 One of her latest accomplishments was Reserve World Champion Barrel, and World Champion Pole Bending. 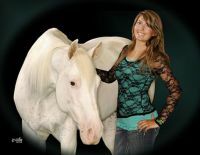 Reserve World Champion, Get of Sire, Medallion Sire, Sire of World, European, and U.S. National Champions. Heterozygous for the gray gene.